There are many baby items that are perfectly safe to buy second hand. Unfortunately there are a couple of items, such as a car seat and a crib, that are safer for baby if bought brand new. New cribs can be very pricey but you do not need to spend a fortune to keep your baby safe during sleep time. The least expensive crib on the market can be perfectly safe for baby as long as it meets the government safety requirements and is assembled correctly. If you do purchase secondhand, make sure it is from someone you know and trust. Regardless of where you purchase, it is important, for the safety of your baby, to always keep an eye on current baby product recalls at www.recalls.gov (in the United States) and http://cpsr-rspc.hc-sc.gc.ca/PR-RP/home-accueil-eng.jsp (in Canada). In my experience, most of these recalls are easily fixable and often the company ships you a small repair kit, free of charge to you, complete with instructions. It is only in more drastic cases where you would actually have to discontinue use of the product you have purchased. When buying new, many baby items come with a registration card that you mail to the company and they will mail information concerning recalls directly to your home. Crib slats must not be more than 2 3/8 inches apart so as to prevent baby from slipping through them. You should not be able to pass a pop can through the slats. If you can, then the slats are not properly spaced. There should be no broken or missing crib slats or any other missing or broken parts of the crib. Hardware should be properly installed on both the crib and the mattress support, according to instructions. Only use original hardware for both. Hardware should not be loose or damaged. The crib mattress must fit snugly inside the crib with no more 1 3/16” (two fingers) width between the mattress and the sides of the crib. If the mattress is not a tight fit, the baby could become wedged into this space and become trapped. There should be no decorative cutouts in any part of the crib, including the headboard and footboard, where your baby’s head or body become trapped. Corner posts should be no higher than 1/16” (US), 1/8” (Canada) above the end panels of the crib. Your baby’s clothing can hang off of them if they are any higher. This includes decorative knobs and posts. The crib mattress support should always be set so that your baby cannot climb out of the crib. You can use the highest setting for newborns but as soon as your baby is able to push himself to his knees you need to set it to the middle setting (usually around 4 – 6 months) and when she is able to pull herself to standing, the crib setting should be at its lowest setting (usually between 8 – 12 months). For more detailed safety standards please visit http://www.cpsc.gov/businfo/regsumcrib.pdf (USA) and http://dsp-psd.pwgsc.gc.ca/Collection/H46-2-03-332E.pdf (Canada). 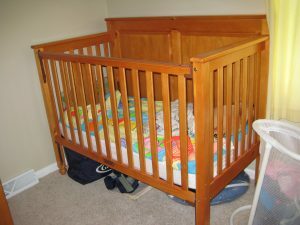 The standard crib is by far the most popular type of crib. It features stationary sides, dual drop sides or single drop sides. For the safety of your baby, however, it is recommended to always keep the sides of the crib to the highest setting. In fact, many crib manufacturers are now doing away with drop down sides. So if you are buying a new crib, it is best to buy one with stationary sides, even though drop down sides are very convenient. If you are buying or using an older crib that has drop down sides, it is best to leave the sides up at their highest setting at all times. Convertible cribs offer all the features of a standard crib but convert into a toddler bed. Some even then convert into a double bed. This means that you pay one time for a bed that will last your baby well into his or her adulthood! Other types of cribs available on the market include round cribs, canopy cribs and portable cribs. Round cribs are fairly new to the market. Canopy cribs are available in standard rectangular shapes or as a round crib. Portable cribs are about one-third smaller than a standard crib and fold up easily for travel. Whatever crib you choose for your baby, just remember to keep safety at the top of your list! What type of crib did you use for your baby? Where did you get yours?